Longhi was one of the most popular artists in eighteenth-century Venice. Turning away from expansive historical and religious subjects, he devoted himself to detailed scenes of contemporary life. Like the work of two French counterparts, Nicolas Lancret and Jean-Antoine Watteau, his art reflects growing attacks on societal conventions, which became one of the hallmarks of the Age of Enlightenment. 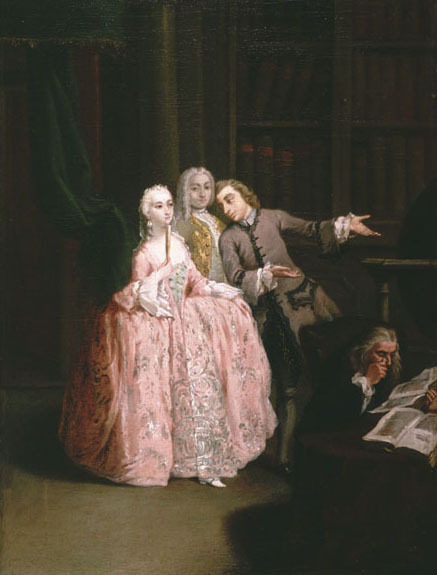 Here, portraying elegantly dressed visitors to a library as somewhat frivolous, Longhi ably captured the graceful decay of the Venetian republic. A gently ironic portrait of fashionable aristocracy, the painting is executed in subtle tones of yellow, silver, and pink against a neutral background.